When the badly beaten body of a young Romanian woman is discovered on a Parisian rubbish dump, the investigation plunges us deep into the murky worlds of prostitution, drugs, business, politics and justice... 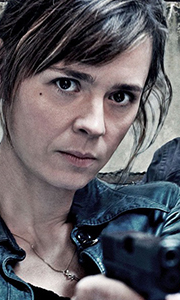 The investigation is led by Pierre Clement, a young recently-named public prosecutor, who teams up with Police Captain Laure Berthaud and investigating magistrate Judge Roban - three indomitable characters with their own methods, b..
All 64 episodes from the first 6 series of the acclaimed French police drama on 16 discs. Powerful performances, utterly believable characters and gripping plotlines have made cult viewing of this gritty, brutal, crime drama set on the mean streets of Paris. No-nonsense and doggedly determined Police Captain Laure Berthaud leads her lieutenants, Gilou and Tintin, in their investigations into serious crime. But they must also battle .. The critically acclaimed crime drama returns for a Third series. When the mutilated body of a young woman is found on a disused railway track in the North of Paris, Police Captain Laure Berthaud seizes the opportunity to restore a tarnished reputation and leads her squad on the hunt for what she believes to be a deranged serial killer. However, with her personal life in tatters and a potential rift emerging from within her own ranks, Be..
Own Spiral Series 4 DVD from Deff, DVD, Blu-Ray & 4K Video Specialists - Free UK Delivery.. The Parisian police and lawyers return for a gripping fifth instalment of the critically acclaimed crime drama series. Police Captain Laure Berthaud is in grief, yet her personal life threatens to be derailed further when she receives some unexpected news. Working with her trusted team of lieutenants, Gilou and Tintin, she leads an investigation into a shocking double murder. Meanwhile, lawyer Josephine Karlsson tries to rebuild her rep..
Spiral is back for another intriguing, gripping and critically acclaimed series about the imperfect people upholding law and order in Paris. Laure Berthaud returns early from maternity leave to help the team put a name to an anonymous murder victim identifiable only by use of his dismembered torso. Meanwhile, a high-profile trial involving a boy accused of murdering his own father tempts a jaded Joséphine. Magistrate Roban grows distrac..
Own Spiral Series 1 to 4 DVD from Deff, DVD, Blu-Ray & 4K Video Specialists - Free UK Delivery..